Junk makeover show. Sarah saves three things from being tipped in Stockport. But Mike and Judith's ladders prove a handful for woodwork genius Rupert. Sarah saves three things from being tipped in Stockport that she thinks she can turn a profit from for the people dumping them. But Mike and Judith's ladders prove a handful for woodwork genius Rupert, and a set of springs nearly breaks artist blacksmith Bex. Sarah pounces on an old Monopoly set, looking for a big payout, and in the end it looks as if there is serious cash to be made by transforming all three pieces of unloved trash into bespoke and valuable pieces. Sarah can then hand over the profits back to the unsuspecting owners... But how much has she made for them? 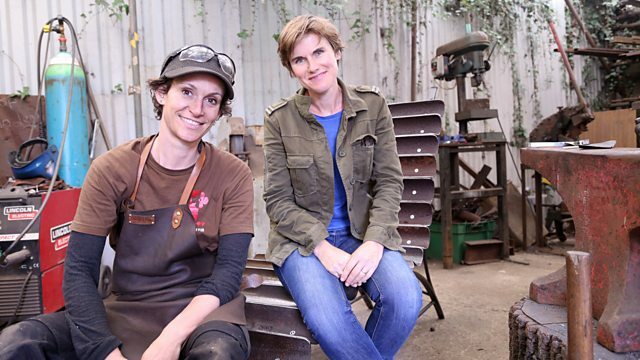 What piece of unloved trash nearly breaks artist blacksmith Bex?